LG G3 smartphone confirmed for Q2 release | What Hi-Fi? LG has confirmed the new flagship G3 will be unveiled on the 27th of May, courtesy of a media invite to the press. A launch event for the smartphone will take place in six cities around the world: Istanbul, London, New York, San Francisco, Seoul and Singapore. LG recently leaked the existience of the smartphone in its Q1 2014 earnings release, stating: "Higher revenues are expected in the second quarter with the release of the flagship LG G3 smartphone". Rumours surrounding the LG G3 phone first surfaced in January. 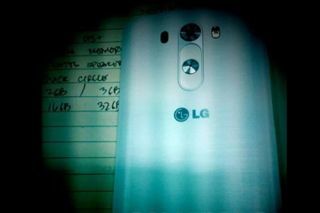 We found details suggesting the new LG G2 successor would be released on the precise date of May 17th. While LG has confirmed the G3 is real, it failed to confirm any specifications, but that hasn't stopped people making predictions, naturally. GSMArena received an image purporting to be the rear of the new LG G3. The picture shows power and volume buttons in similar positions to the ones found on the G2, which broke with tradition by putting buttons on the rear of the unit. However there also appears to be the addition of a sensor next to the camera. It is as yet unclear what this sensor will do, though a fingerprint sensor, following the addition of such a feature to the iPhone 5S and Galaxy S5. Other rumoured specs so far include a 5.5in Quad HD 2560 x 1440 '2K' display, Optical Image Stabilisation+ (OIS) camera, 3GB of RAM, 16/32GB onboard storage and a microSD card slot. With the release of the LG G3 perhaps not that far away, expect to see many of the specs revealed soon.